Summary: This devotional book for the season of Lent begins on Ash Wednesday and ends with Easter Sunday. Each day provides a set of two devotions (one for a child and one for an adult) that focuses on a symbol, a memory verse, songs to sing, scripture readings, a short devotion, children and family activities, and a prayer. An appendix provides recipes for the season that accompany many of the devotional activities as well as a brief explanation and mini version of The Passover Seder (highlighted on day six.) The book can be used as a family spiritual practice or as an individual devotion guide. Literary elements at work in the story: The use of symbols is at the heart of this book and permission is given to copy the pencil drawings for a family (or church) to use in creating their own Lenten Tree. Each symbol ties to a Bible story that is part of the scripture reading for the day. Because of the systematic numbering to match the 40 days of Lent, there is a mixture of Old and New Testament readings providing connecting points for the whole of God’s Story of redemption and salvation. Songs are suggested but the texts are not provided, leaving the reader to go in search for words and tunes among hymnals and internet searches. Likewise, scripture references are given without the texts, requiring the reader to have a Bible on hand for easy reference. By setting up the book in this way, Smith makes it clear that this is a resource to be used in conjunction with one’s own Bible and other resources that help create a richer experience rather than just a book to be read and set aside. How does the perspective on gender/race/culture/economics/ability make a difference to the story? Written over a ten year period, the devotions in the book come through the personal encounters Smith has experienced in her years as a professional educator and musician in the Methodist church. Born, raised, and educated in Mississippi, Smith writes from a southern perspective that is inclusive and inviting. Her song suggestions are “old southern hymns” but her suggestions for children and family activities are modern (without technology) and current. She is an experienced writer who offers this book as a sequel to her book, The Advent Jesse Tree. Theological Conversation Partners: Many people think of Lent as a time of fasting and giving up something, like chocolate, or red meat on Fridays. Lent, however, is not about being miserable; it’s about entering into a time of preparation, repentance and self-discovery leading up to Easter. The spiritual practice of “setting aside the ordinary to focus on the extraordinary” is one that brings meaning and richness to the long season of preparation. Lent is the Church Year’s “springtime.” Out of the cold and darkness of “sin’s winter” emerges a people—the Church—reborn in their Lord’s Easter resurrection. Although Easter is the oldest Christian season, the observance of Lent did not begin until 200-300CE. Lent was a time of preparation for persons being instructed in the Christian faith before their baptism. Following the model of Jesus’ time in the wilderness, new adult converts practiced Lenten penance and prayer for 40 days while waiting to receive their baptism, confirmation and first Lord’s Supper at the Saturday evening vigil before Easter. Today Lent calls us to take time out and look back on the impact of our baptism on our lives. How are we doing, we who have died to sin and come alive to new life in Christ? In repentance we ask our Lord to clear our hearts and lives of sin’s self-centeredness. The Lenten journey is a long one that is somber and bitter as we re-trace the final steps of Jesus and remember the pain and suffering he endured on our behalf. Why did God’s beloved Son have to give up his life for us? The very first day of Lent, Ash Wednesday, tells us that story. On Ash Wednesday we hear again how Adam and Eve disobeyed the Lord God in the Garden, casting aside the perfect harmony that God had created and consequentially creating a separation between humankind and our Creator God. Throughout the Lenten season, we examine our own lives and come to God in confession for the ways that we, like Adam and Eve, have cast aside God’s perfect harmony. It is a time of “wandering in the wilderness” as we come face to face with our own sin. But we are not alone in the wilderness. Our Lord Jesus is with us, giving us comfort and strength to come face to face with our own choices, motives, thoughts, words, and actions. By the fifth Sunday in Lent, we come face to face with death. But, as was the case in the Garden of Eden, we also continue to see a God who is “gracious and merciful—and abounding in steadfast love,” a God who is willing to sacrifice in order that we might be rescued from the results of our sin. If “we are dust,” Jesus is with us in this wilderness, sharing our dust—our humanity—and eventually sharing its outcome. For our sakes, he will “return to dust” and die. How can we endure this long season of “wilderness wandering” without being consumed by it? With our eyes fixed on God, we endure with hope, for the season of Easter rejoicing is ahead – bringing with it a joyous reunion and reconciliation with our grace-filled God! What do you think of whenever you see a cross? How do you show your gratitude to God for the life and sacrifice of Jesus? How do you pause and remember Jesus during the season of Lent? What spiritual practices to you begin/adopt/renew? How can symbols help you pause and remember God’s love for you shown through Jesus Christ? What symbols would you add to the book? What do those symbols mean to you? How do your additional symbols help you celebrate and proclaim God? 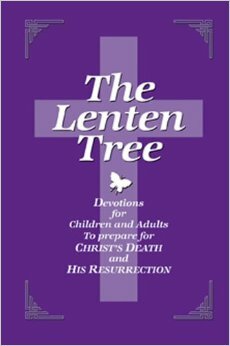 The Lenten Tree: Devotions for Children and Adults to Prepare for Christ’s Death and His Resurrection by Storypath is licensed under a Creative Commons Attribution-NonCommercial 4.0 International License.